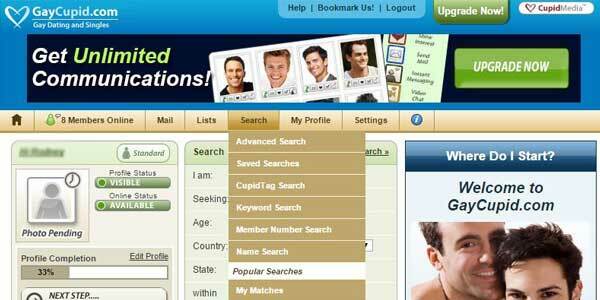 For gay singles who are looking for someone special GayCupid.com is an ideal platform. Superbly presented and very simple to use, it provides a relaxed online environment in which to meet someone for a serious relationship. There are plenty of methods to communicate with other users, while at the same time gay cupid also provides some innovative features of its own. This is a quality dating site, both in terms of the design itself and the typical users it attracts. You will find plenty to keep you engaged and busy as you search for that perfect someone. And all of this for an attractive price. Firstly, getting in touch with other users is tailored to your own preferences, with so many different options on offer. In addition to e-mail and instant messaging, you can also send a cheeky flirt in the form of a heart icon. However, if you really want to make your introduction stand out, then consider sending a video mail, one of the unique tools the gay Cupid dating site has to offer. If you are looking to simply get a feel for the kind of matches available, then it is well worth visiting the video chat rooms and message boards. Meanwhile, the site also includes a range of useful advice, news and information for gay daters. Searching for someone is given an added twist with the useful “Cupid Tag" tool and if you are looking internationally, take advantage of the site’s translation feature. Safe and secure usability is all part of the gay cupid.com service. 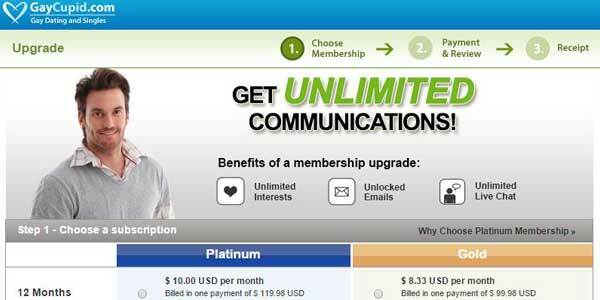 The site’s administrators use anti-fraud technology to weed out scammers. Meanwhile, the safety tips page gives useful advice for both online and offline dating. Most importantly perhaps, you can block users who you feel threatened by and also hide your profile for enhanced anonymity. Straightforward and incredibly simple. As any gay Cupid.com review will note, you should be searching for someone special within just a few minutes. The first step is to simply submit your first name, password and e-mail address. You will then be prompted for your date of birth and location. Interestingly, among the additional personal details, you will be asked about your willingness to relocate, indicating the typically serious intentions of daters at GayCupid.com. There is also an opportunity to say a little more about yourself and your potential partner, which is a great chance to really pinpoint what you are looking for. Finally, you will be asked for a photo and when you begin to populate your profile, you can specify the kind of relationship and sexual preferences you would like. GayCupid.com doesn’t use behavioral matchmaking algorithms like Zoosk.com, but instead uses all of this information to make accurate matches. This really is an incredibly simple site to use. Frankly even if you have never used a dating site before, you will intuitively find Gay Cupid a breeze. For a start, the design is pleasing on the eye and so each component is set out logically and clearly. The tabs at the top of your personal dashboard take you directly to your profile, inbox and the search function. For your convenience, you can create lists of favorites, which are also accessible via the top of the page tabs. Meanwhile, a sidebar panel gives you an at a glance summary of your account, including who has viewed your profile. Usefully, there is also a constant count of how many users are currently online. For a start, recommended matches will automatically be generated and displayed on your personal dashboard. However, if you want to be more pro-active, then you can conduct a search. The advanced search is truly exhaustive. It allows you to really pinpoint the kind of guy you are looking for, allowing you to look for someone based on all aspects of their physical appearance, background or lifestyle. You can also search via keyword and the searches that work for you can be saved. However, one of the most exciting aspects of the site, which any gay Cupid.com review will highlight, is the Cupid Tag feature. Rather than search via a definitive keyword, such as location or age, the Cupid Tag allows you to search for someone based on a personality trait, such as “serious" or “outgoing." Looking for someone based on their characteristics can be much more useful in finding the right person for you.